The Hyde Park Railings Affair is a little-known protest that took place 149 years ago today in Hyde Park. When the Home Secretary banned a rally organised by the Reform League from taking place in Hyde Park, the League decided to question the legality of the ban by marching to Hyde Park anyway. Demonstrators managed to break into the park, which led to scuffles with police and several days of rioting. The protest questioned the nature and control of public space in London, and contributed to Hyde Park’s radical legacy. The Reform League was an organisation formed in 1865 to campaign for universal manhood suffrage in Britain. They had their origins in the Chartist movement, but they were not as radical. After the failure of the 1866 Reform Bill, controversy over which brought down the government in June, the Reform League decided to step up their campaigning by organising mass meetings. Meetings on the 29th of June and 2nd of July in Trafalgar Square were relatively peaceful, but the League’s next meeting was destined to be more controversial. Edmond Beales, President of the Reform League (Source: Oxford Dictionary of National Biography). The Conservative Home Secretary, Spencer Walpole, banned the planned meeting in Hyde Park. Edmond Beales, the president of the Reform League, argued that the Home Secretary had no right to ban the demonstration, as the park either belonged to the people or the monarchy. Spencer Walpole was neither, therefore he had to right to dictate what was allowed to happen in the park. The protest became about more than electoral reform; it was now also about who had the right to use, control, and police public space. The Reform League decided to challenge the legality of the ban by marching to Hyde Park anyway. On the afternoon of the 23rd of July, the League and their supporters set out from their headquarters in Adelphi Place towards Hyde Park. When they got to Marble Arch, they found the gates locked and guarded by the police. Edmond Beales requested to be allowed entry, but he was not prepared to start a violent confrontation, so he withdrew when he was refused permission to enter. Beales and the Executive Committee of the Reform League led the march to Trafalgar Square, where they had a peaceful meeting. A contemporary illustration of the Hyde Park Railings Affair (Source: Illustrated London News). Not everyone followed Beales and the Reform League however. A group of protesters stayed behind, and soon discovered that if the railings surrounding Hyde Park were rocked back and forth, they could be pulled from their foundations and toppled over. This happened at several locations around the park, leading to clashes with police as demonstrators poured into Hyde Park. There were injuries on both sides, but no deaths, and 40-70 people were arrested. The Police used Marble Arch as a temporary holding cell. Rioting continued in the park for several days, which resulted in a lot of damage to the park. The stump of one oak tree which the protesters burnt down became known as the Reformers’ Tree. It became a focus point for radical activity in the park, and is commemorated by a mosaic. In 1872 the right of assembly and free speech was officially recognised in the northeastern corner of Hyde Park by the Royal Parks and Gardens Act. Speaker’s Corner is now a world famous site of public speech and debate. 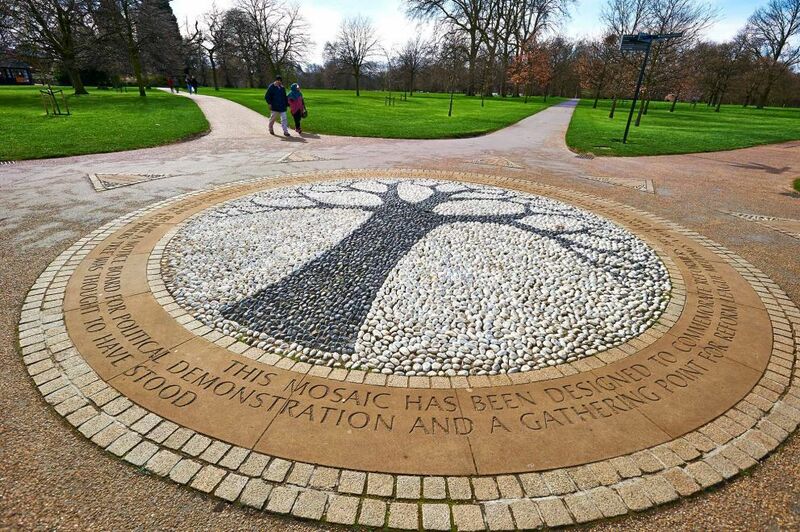 The memorial to the Reformer’s Tree, near the site where the tree was thought to be located (Source: Royal Parks). The Hyde Park Railings Affair is one of several protests in London that escalated because of government attempts to suppress protest, and Londoner’s determination to assert their rights; Bloody Sunday is another. Access to public space and the right to assembly is something many of us take for granted, but it is not a given. It has been fought for by generations of Londoners, and still needs to be defended. Anon., “History and Architecture,” Royal Parks. No date, accessed 28th September 2014 https://www.royalparks.org.uk/parks/hyde-park/about-hyde-park/history-and-architecture. Tames, Richard. Political London: A Capital History. London: Historical, 2007.